Agent data is data that is currently being extracted by the agent. 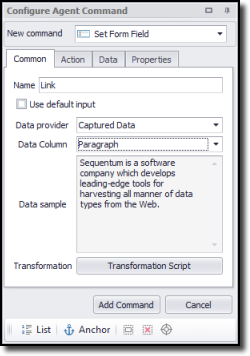 For example, data extracted by a capture command could be used as input to a form field command. Agent data can be used by data consumer commands, but the data consumer must be a sub-command of the capture command which is extracting the data. Else, it must have the same parent command as the capture command. See Agent Data for more information. Agent data is the data that the agent is currently extracting, and it can be put to use by other commands at runtime. If another command uses such data, then it must execute after the command that extracts the data. Otherwise, the data wouldn't be available. Also, the command using the data must be a sub-command or have the same parent command as the command that extracts the data. Agent data is often used when resolving CAPTCHA images. You can automatically process a CAPTCHA page by using an OCR service to convert the CAPTCHA image into text, and then use that text in a form field command to set the CAPTCHA input box. A CAPTCHA page or section appears on some websites to protect access to a secure area of the website. A CAPTCHA image displays a sequence of numbers and characters that a website user must type into an input box in order to continue to the secure area. This process ensures the website user is a real human and not an automated agent. See the topic CAPTCHA Blocking for more information.